BIRTH DATE : Friday 17th Rabi-ul-Awal 570 A.D. The oldest and noblest tribe in the whole of Arabia was Banu Hashim. They were the descendants of Ibrahim through his son Isma”il. The Arabs respected and loved them for their goodness, knowledge, and bravery. In Mecca, a baby boy named Muhammad was born on 17th Rabi” al-Awwal, 570 AD. His father “Abdullah, son of “Abd al-Muttalib, died before he was born and when he was six, he lost his loving mother Aminah bint Wahab. His Grandfather, “Abd al-Muttalib, took the responsibility of bringing up the orphan. At the age of ten, he was berefted of his venerable grandfather. On his deathbed, he appointed his son Abu Talib as the guardian of Muhammad. As a gentle, soft spoken, tall and handsome boy, Muhammad, accompanied the trading caravans of Abu Talib, across the deserts, giving him deep insight into nature and man. The wealthy noble widowed lady Khadijah, in looking for a manager for her rich merchantile caravans, selected Muhammad (SW) as her manager. The able and fair dealing Muhammad (SW) was a tremendous success. Khadijah already an admirer of Muhammad (SW), made him an offer of marriage. Muhammad (SW) was twenty five and Khadijah forty. In spite of this disparity in age, the marriage proved to be a very happy one. With the death of the old patriarch Abu Talib, the Meccans planned to assassinate the prophet. 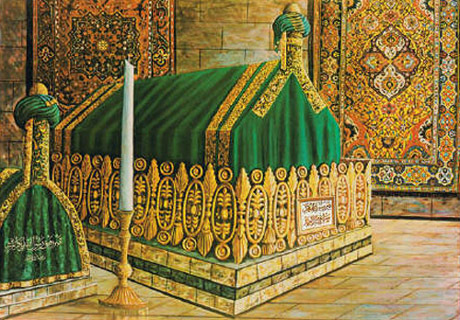 Under Divine guidance, he asked “Ali to sleep in his bed and Muhammad put his green garment on “Ali. While the murderes mistook “Ali for muhammad, the Holy Prophet of Islam escaped to Medina. The Muslim era of Hijrah (Emigration) is named after this incident and dated from 17th Rabi” al-Awwwal, 622 AD. From the time he came to Medina, he was the grandest figure upon whom the light of history has ever shone. We shall now see him as the King of men, the ruler of human hearts, chief law-giver and supreme judge. The Preacher who went without bread, was mightier than the mightiest sovereigns of the earth. No emperor with his tiaras was obeyed, as this man in a cloak of his own clothing. He laid the foundation of the Muslim commonwealth and drew up a charter which has been acknowledged as the work of highest statesmanship, a master-mind not only of his age, but of all ages. Unlike the Arabs, the Prophet, had never wielded a weapon, but now he was forced to defend Islam by force of arms. Commencing from the battle of Badr, a series of eighty battles had to be fought, which the infant community defended successfully. Next year, Abu Sufyan, the famous long-lived enemy of Islam, again attacked the Muslims at Uhud. Hamzah, the first flag-bearer of Islam and uncle of the Prophet, was killed in action. In spite of strict instructions from the Prophet, a few Muslim soldiers Disobeyed the Prophet and deserted their post, when victory was in sight. This changed the course of the battle. Khalid ibn al-Walid attacked the Prophet and the grave situation was saved by the timely arrival of “Ali. Who fought bravely with the enemies of Islam, and he fought with such authority that the enemies had to retreat . The enemies ran away and the issue was decided. Prophet Muhammad PBUH was deeply grieved at the death of Hamzah. The Muslims had been in self exile for six years and began to feel a keen yearning for their homeland, Mecca. The Prophet desired to perform a pilgrimage to Ka”bah. When he forsook his home town he was weak, but when he wanted to return, he was strong. He did not use his strength to force an entry into the sacred city. Finding the Quraysh hostile, Muhammad entered into a treaty Known as the Peace of Hudaybiyyah, appearing not very advantageous to the Muslims,and the New Converted Muslims , who had even earlier disobeyed the Prophet Muhammad , in the Battle Field of UHUD , even tried to disrupt the Peace process , and tried to interfere in the Wisdom of the Prophet , but the Peace Treaty which revealed the Islamic character of moderation and magnanimity. For the strong to exercise restraint and toleration is true courage. Having reached up to the door of their birth place with hearts over-flowing with impatient longing to enter it, the Muslims retraced their steps peacefully to Medina, under the terms of the treaty, which allowed them to perform the pilgrimage next year. In The 8th year AH, the idolaters violated the peace of Hudaybiyyah by attacking the Muslims. The enemies were defeated and Mecca was conquered. The Prophet who fled from Mecca as a fugitive, now returned home as a mighty conqueror. The Rahmatun lil “Alamin (mercy unto all beings of the Universe, i.e., the Prophet ) entered the city with his head bowed low in thankfulness to the Almighty (Allah) and ordered a general amnesty, instead of the mass massacre of those who persecuted him and his followers. A great number of Muslim soldiers were killed in battles at Badr, Uhud, Khaybar, Hunayn and other places, leaving behind young wives and children. The serious problem of taking care of the widows and orphans, threatened to break up the moral fabric of the Muslim Society. Muhammad decided to marry these widows and set an example for his followers to do likewise. On His return to Medina, he got busy settling the organization of the provinces and the tribes which had adopted Islam. But as His strength rapidly failed and the poison (administered at Khayber by a Jewess) took its deadly toll. So ended the life dedicated to the service of God and humanity from first to last, on 28th Safar, 11 AH. The humble Preacher had risen to be the ruler of Arabia. The Prophet of Islam not only inspired reverence, but love owing to his humility, nobility, purity, austerity, refinement and devotion to duty. The Master inspired all who came into contact with him. He shared his scanty food; he began his meals in the Name of Allah and finished them uttering thanks; he loved the poor and respected them; he would visit the sick and comfort the heart broken; he treated his bitterest enemies with clemency and forbearance, but the offenders against society were administered justice; his intellectual mind was remarkably progressive and he said that man could not exist without constant efforts. There is no god but One God and Muhammad is the Apostle of God, peace and blessings of Allah be upon him and his descendants. 1. When the innovations & heretical practices becomes evident in my Ummah it is necessary for the scholar to make his knowledge manifested & open (with regards to making the innovations public) so, curse of Allah be upon the scholar who does not do it. 2. One who starts a morning in a condition that he does not make effort about the affairs of the Muslims is not one of the Muslims. And a person who hears the voice of a man who calls the Muslim to his help but he does not respond him, is not a Muslim. 3. I do not have the fear of neither the faithful not polytheist about my Ummah. However, the faith of the faithful refrains him from harming the Ummah, more over the infidelity of the polytheist will become the cause of his abjectness & repression. But I am afraid about you (being harmed) from the glib tongued hypocrite. He utters by his tongue what you believe is good & practically he does what you consider bad (vices). 4. There is a good deed above each good deed, to the extent that a man is slain on the way of Allah. so when he is slain on the way of Allah then there is no good deed above (better than) it. 5. The one who pleases a ruler with something which is the cause of Allah”s fury has gone out of Allah”s religion. 6. One who comes to a rich man & shows humbleness to him for the sake of his wealth has lost two third of his religion. 7. When the resurrection day will come, the ink of the pen of scholar will be weighed against the blood of martyrs, so as a result of weighing the ink of the pen of scholars will get superiority over the bloods of the martyrs. 9. Cursed is the one who puts the load of his life responsibilities upon the shoulders of the people. 10. When the dooms day will come about, man will not move one step from his place till he is questioned about four things. a. The way how he spent his life? b. As to how did he wear out his youth? c. About the wealth, as to where he got it from & in what way he spent it? d. And about the love of us the household of prophet. a. The eye which remained waking in the night till morning on the way of Allah (for the defense of Islamic system). b. the eye which refrained from seeing the the things prohibited by Allah. c. The eye which shed tear from the fear of Allah. 12. I am the city of knowledge & Ali is it”s gate so whoso ever intends to acquire knowledge must come through the gate. 13. Oh Abazar! do value & esteem five things before five others (to happen). a. your youth before your old age. b. your health before your ailment. c. your wealth before your poverty. d. your life before your death. 14. Allah does not look at (value) your faces & nor your wealth”s but he looks at your hearts & your practices. 15. Oh people! I have left among you some thing which if you get (hold of) it, you will not go astray: The book of Allah (Quran) & my progeny, household. a. This becomes the cause of getting dishonored. c. Causes the shortening of age. a. It causes the anger of Allah. b. It causes the severe ness & graveness of accounting. c. It causes the eternity & perpetuity (of man) in the hell fire. 17. Beware! one who died with the love of household of Prophet (P.B.U.H) has died as a faithful, having complete faith. 18. Drinker is similar to the idolater. Oh Ali! Allah does not accept the service of the drinker (up to) forty days. And if he dies with in forty days, he has died as an infidel. 19. One who postpones and delays the performing of Hajj (having got it”s capacity) till the time he dies. Allah will resurrect him as a Jew or Christian on the justice day. 20. Sighting (at stranger man or women) is a poisonous arrow out of the arrows of Satan. So one who overlooks & omits that due to the fear of Allah, Allah bestows upon him a faith, the sweetness of which he will find in his heart.